A manufacturing district… sends out, as it were, suckers into all its neighbourhood. Henry Hallam was an English historian. He educated at Eton and Christ Church, Oxford. He practised as a barrister on the Oxford circuit for some years before turning to history. His major works were View of the State of Europe during the Middle Ages, The Constitutional History of England, and Introduction to the Literature of Europe, in the Fifteenth, Sixteenth and Seventeenth Centuries. He was a fellow of the Royal Society, and a trustee of the British Museum. 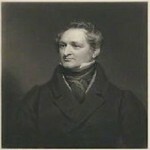 In 1830 he received the gold medal for history founded by George IV.